These arrangements of scores by Mahler were made for the Society for Private Musical Performances which Schoenberg founded in Vienna in November 1918. The aim of the Society was to present performances of modern music to bring them to the attention of a small but discerning public, namely the supporters of the Society. Katy Hamilton tells us in her useful booklet note that over one hundred works were presented during the three years of the Society’s existence. Many of these were chamber works but larger pieces, such as symphonies, were performed too, initially in piano arrangements but occasionally in versions for small ensemble; these were made specially for Society performances. Schoenberg and his pupils, Webern and Berg, both of whom were closely involved in the venture, were avid Mahler enthusiasts so it’s not surprising that they should have sought to draw attention to some of his scores through the Society. Katy Hamilton tells us that the first performance of the arrangement of Lieder eines fahrenden Gesellen took place in 1920 under Schoenberg’s direction. She doesn’t specify the scoring used by Schoenberg but I presume that both the arrangements here recorded utilised the instruments whose players are named in the booklet, namely string quartet, double bass, flute/piccolo, oboe/cor anglais, clarinet, bass clarinet, bassoon, horn, piano, harmonium/celesta and percussion (two players). I can’t recall hearing this arrangement of Lieder eines fahrenden Gesellen before but it works quite well. The reduced forces bring a pleasing lightness and intimacy and the arrangement is skilfully done. I didn’t miss the sound of Mahler’s full orchestration as much as I’d expected although I was conscious of the lack of weight and reduced colouring at times, notably in the stormier passages of ‘Ich hab’ ein glühend Messer’. It’s a great pleasure to hear Roderick Williams in these songs. He brings all his customary clarity of tone and diction. Mahler takes his singer very high at times but Williams has a wonderful, easy top to his voice so these passages cause him no problems at all. I admire his care for the words throughout but especially in ‘Ich hab’ ein glühend Messer’ – his delivery of the last two lines of the text is highly expressive. His account of the fourth song, ‘Die zwei blauen Augen von meinem Schatz’ is intense and inward. In this song he delivers the third stanza expertly; the line is seamless thanks to his marvellously even legato. This is a very fine account of the songs and he’s expertly supported by JoAnn Falletta and her expert ensemble. It’s not quite clear who was responsible for the arrangement of Das Lied von der Erde. Katy Hamilton tells us that Schoenberg began it but then passed it on to his pupils, perhaps including Webern. However, a few years ago I reviewed another recording of the chamber version of Das Lied – or perhaps I should say of a chamber version. That version was completed by the German composer Rainer Riehn and the booklet note stated that “Schoenberg was only able to complete a large portion of the first song before delegating the task to Webern. By then  the Association was effectively bankrupt, so the score lay unfinished until 1983, when Rainer Riehn completed the sketch based on Schoenberg’s original orchestration.” Rainer Riehn is not mentioned in the Naxos documentation so whose version is performed on this Naxos CD? Did Schoenberg and/or his associates get a lot further than the annotator for that Avie disc believed? The arrangements of Das Lied and other works were made for the wholly laudable purpose of drawing attention to contemporary scores at a time when concert performances of the full scores were likely to be, at best, very infrequent and broadcasting and recording were in their infancy. 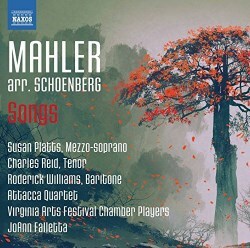 However, now that performances of Mahler’s full score are so readily accessible I do wonder if there is such a need to revive the Schoenberg arrangement. I know of at least seven other recordings of the chamber version. Even allowing for the desire of chamber groups to add Mahler’s score to their repertoire do we need so many recordings of the arrangement? As Katy Hamilton readily admits in her notes in the chamber version the first song, ’Das Trinklied vom Jammer der Erde’ is “deprived of some of its menace and sonic force”. That’s certainly true and anyone familiar with Mahler’s original will readily spot that the orchestration has some big holes, not least in the interlude before “Das Firmament blaut ewig”. For me, far too much is missing. The tenor part in this first song is a cruel test, the tessitura unforgiving. Even so, I might have expected that freed from the necessity to project his punishing lines over a large orchestra Charles Reid might have relaxed somewhat. In fact, to my ears Reid still sounds taxed by the music on quite a number of occasions. His is a stalwart tenor and he delivers a pretty forthright performance. I was disappointed in his lack of delicacy in ‘Von der Jungend’; this is another pretty full-on performance despite the slender scoring. Even allowing for the demands of the high-lying vocal line I didn’t enjoy this very much, finding insufficient subtlety. In his final song, ‘Der Trunkene im Frühling’ Reid does relax a bit more and that’s welcome. Overall, though, I didn’t find his reading memorable and, to be frank, his contribution would not be a reason for buying this disc. Susan Platts is a very different matter. I don’t believe I’ve heard her before but I was impressed. At the same time as I was appraising this disc I was working also on a review of another recording of the work but one which uses a baritone rather than a mezzo. Miss Platts reminded me why I so strongly prefer a mezzo in this work. There’s appealing warmth to her tone and I liked the expression she brings to the music. If I have a criticism it would be that her words aren’t always ideally distinct. Her first song, ‘Der Einsame im Herbst’, works quite well in the chamber version – I like the fragility of the instrumental opening, for instance. Miss Platt is very expressive in the passage beginning “Mein Herz ist müde”. Later on, in the section from “Sonne der Liebe” I had the impression, perhaps wrongly, that her pitching is a tiny bit sharp as she strives for expression but even if I’ve heard that correctly it’s a momentary blemish. In the opening pages of the second song, ‘Von der Schönheit’, I wondered if her tone, though pleasing, was a little unvaried. However, she offers ample compensation in the last stanza which is very nicely turned. The opening of ‘Der Abschied’ is successful. I greatly enjoyed the playing of the oboist, Sherie Lake Aguirra, while the flautist, Debra Wendells Cross is outstanding. Susan Platts sings her first phrases eloquently: this augurs well. She maintains this high standard throughout and her delivery of this long, complex song is a conspicuous success – sample, for instance, the withdrawn way she sings “Es wehet kühle”. However, when we get to “O Schönheit, o ewigen Liebens” despite the deep commitment with which Miss Platts invests the music and the best efforts of the players the overall sound seems undernourished. That’s even more the case in the extended instrumental interlude which follows shortly thereafter (16:07 – 21:23). I mean no criticism of the players but with these reduced forces the music comes across as underpowered and lacking in colour. Frankly, the climax of this passage (20:20) sounds puny. When Susan Platts resumes singing she brings exemplary control and a sense of suspense to the music. Starting at “Ich wandle nach …” she builds the intensity most impressively so that, vocally at least, “Du liebe Erde” is a great outpouring. Here she’s suitably rapturous but the accompaniment is thin. At the end of the performance I was left admiring Susan Platts’ singing greatly and also the skill of the members of the instrumental ensemble yet I felt somewhat cheated. I take my hat off to those people who can listen to this arrangement and put the sound of Mahler’s full score out of their minds so that they can concentrate on the skill and textural clarity of this arrangement. Sadly, I can’t do that, though I readily acknowledge the musicality of the reduced scoring. Summing up, then, the playing throughout this disc is admirable; I’m not over impressed with the tenor but Susan Platts is very fine and JoAnn Falletta conducts both scores expertly. Roderick Williams is also very fine in Lieder eines fahrenden Gesellen. If you want to hear the chamber version of Das Lied von der Erde – and it’s interesting to hear it once – then this disc is well worth your attention. I would dearly love, though, to hear Susan Platts in Mahler’s original and incomparable scoring one day.